In 2010, mobile advertising, though already big business globally, was still a niche industry in India. Dippak Khurana, however, was among those who read the tea leaves early. He launched a company, Vserv, with the aim of offering mobile marketing solutions to monetise the medium for both, mobile site publishers as well as mobile app developers. Five years on, it is among the two largest Indian players in the Rs 520 crore mobile advertising industry which, according to Ficci-KPMG report, is set to grow at 48 percent annually. It started out right, by launching AppWrapper, targeting mobile app developers: This is a plug-and-play software, which allows users to pick and choose advertisements from any mobile advertising network, and not just Vserv’s. But Vserv also put together a set of advertisers for mobile app developers, who get 60 percent of the ad revenues. As an outsourced advertising sales solution, AppWrapper allows the developers to focus on the app. “Within six months we got advertising requests from 20 countries and witnessed 10 million [advertising] impressions a day. This product enabled giving the app a layer of advertisement without opening the source code. We offered simplicity for developers and quickly built a user base,” says the 42-year-old Khurana. Vserv has also been collecting data about mobile app users and thereby understanding the mobile consumer’s behaviour patterns. It uses this knowledge to offer targeted advertising solutions, which lead to higher click-rates and better margins. Today, it has access to 500 million unique mobile user profiles globally and 120 million in India. Vserv clocked $27 million (about Rs 175 crore) in revenue in FY2015. The team size has kept pace with growth: From six staffers in 2010, it now has 220. The entrepreneurial bug bit Khurana early. And his interest is product-neutral. In his last two years studying commerce at Narsee Monjee College of Commerce & Economics in Mumbai, Khurana, along with a friend, sold custom-designed T-shirts with images of the latest rock bands printed on them. After college he moved to Jamshedpur in 1993 to start a poultry business with his uncle. After running it successfully for almost three years, Khurana sold it and moved back to Mumbai to pursue an MBA at his alma mater. Over a decade of working in various companies—the digital division of Bennett, Coleman and Co. Ltd, Yahoo! (India) and People Infocom (Mauj)—gave him skills and expertise in the digital and mobile domain. He drew on this to revisit his entrepreneurial instinct in 2010, when he launched Vserv along with his friend (now CTO) Ashay Padwal, with angel funding of Rs 75 lakh from Ajay Adiseshann, founder of Paymate. When several internet companies were trying to grasp and fix their business models for desktop advertising, Vserv was building capabilities for the transition to a mobile platform. With more than 900 million mobile phone connections in India alone (as per Trai), Vserv decided to tap into mobile marketing opportunities in India and Southeast Asia first, rather than spread itself thin across the globe at this stage; it is present in seven international geographies. It has launched a mobile commerce solution for telecom and DTH companies. This solution will map mobile users to add to Vserv’s data collection. For example, a 2G mobile phone user whose internet data usage limit is about to expire will be shown an ad for a new data pack or an upgrade option to 3G from his/her own mobile service provider. Or a college student can be pitched a special night-data pack to facilitate late night chats with friends and family. As the billing mechanism is directly plugged into the service provider, payment for these offers is streamlined and services are activated conveniently. While Vserv gets a share of the earnings from such transactions, this solution helps increase the average revenue per user for telecom and DTH companies. 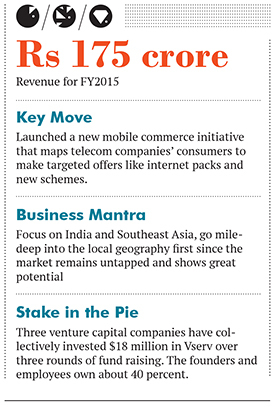 Such an offering is a first from any mobile solutions company, claims Khurana. He sees this foray showing significant growth in the next two years, and expects a 70 percent increase in overall revenue by March 2016; his target for FY2017 is $100 million (about Rs 650 crore). Khurana is a patient man, and wants each move to be calibrated and well thought-through. Even though his competitors, most prominently Bengaluru-based InMobi, have raised over $200 million in funding and expanded globally, Vserv has only raised $18 million over three rounds through private equity firms IDG Ventures, Epiphany Ventures and Maverick Capital. Competition is a constant challenge for Vserv, as it is pitted against homegrown Indian mobile marketing companies such as InMobi (with revenues above $200 million) as well as global players such as Google and Facebook (between them, they account for 60-70 percent of mobile advertising spends in India alone). Beyond that, businesses built around the digital domain are fraught with the danger of obsolescence. Internet advertising is a decade-long phenomenon and, already, mobile has emerged as a new platform with consumers swiftly migrating to devices such as phones and tablets. But the mobile medium too could soon get challenged when Internet of Things (IoT) becomes commonplace with smart homes, smart refrigerators, smart kitchens and smart cars becoming common. Companies like Vserv, that bank on the mobile medium, will need to pivot their business models and adapt to the newer platforms. After all, it will be the survival of the swiftest.